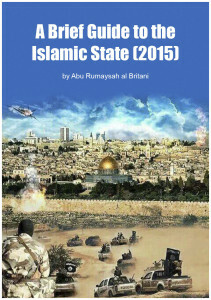 An ISIS defector from the UK has published an e-book called “A Brief Guide to the Islamic State” (2015 Edition) that is posted on a popular social media site used by ISIS to publish propaganda, called Internet Archive. The Guide is consistent with ISIS terrorist propaganda messages: it gives information on life under the Islamic State to encourage recruitment to Syria; it reveals trade-based terrorist financing; and it ends with threats against the West. More than anything else, the Guide begs a lot of questions about terrorism and commercial material support from other countries to ISIS controlled areas. The Guide, to the extent the e-book is to be believed, makes it obvious that not enough appears to be being done in the way of stopping material support in areas controlled by ISIS and in particular trade-based terrorist financing. The Guide says that in ISIS controlled-areas, new cars from Kia and Hyundia and motorbikes from China are imported and sold. It also says that defectors can buy the same electronics they can get in the West including cellular phones, computers, tablets and laptops. One of the questions this begs is what manufacturers are selling technology to ISIS or for the benefit of ISIS? In trade-based terrorist financing, conduit countries are a concern. The Guide also says all mobile apps from the West are available for download but that some of the free ones are better (Kik, Skype, Ask.fm). With respect to Skype, Ask.fm and Kik, terrorists say that the companies running those apps provide services to them in ISIS controlled areas. It is believed that ISIS uses those services to radicalize others to commit terrorist attacks against the West and to recruit defectors to Syria who are committing acts of terrorism there. ISIS uses social media to recruit, encourage attacks in the West, socialize Westerners and for terrorist financing. You can read more about that in our White Paper on the Twitter Terrorist. The Guide confirms that the social media campaign of ISIS is meant to “persuade.” So is the Guide. It tells prospective defectors that in ISIS controlled areas, when they walk the street, they will be “loved” and supported, and that the people of Syria will seek their counsel and advice because they are symbols of liberation, suggesting that even the most unaccomplished defector will be a superstar in Syria. ISIS terrorist propaganda on social media is usually contradictory on the issue of lifestyle. The Guide is similarly inconsistent. The Guide says that ISIS has successfully recruited defectors by honestly focussing on the hardship of life in Syria. But that’s not accurate. ISIS consistently paints a picture of how amazing life is and promises defectors a life of relative comfort with slaves available to carry the load. Even the Guide contradicts its own so-called hardship stance by devoting pages to describe how defectors can buy cafe lattés, cappuccinos, fruit and vegetables, American chocolate bars, new cars and motorcycles in land controlled by ISIS. According to the Guide, there is ample Internet access and the latest technology “gadgets” for sale. According to the Guide, life under ISIS is normal and you won’t want for much in the way of material things. The Guide ends, as all ISIS terrorist propaganda ends, with the promise that ISIS will descend upon the streets of Washington, London and Paris to spill the blood of, inter alia, Americans, demolish Western landmarks, erase our history, and “most painfully” according to the Guide, convert our children who will then curse us. ISIS will succeed, according to the Guide, because allegedly we lack the stomach to fight ISIS long-term. That’s not accurate but, despite the number of defectors who have returned, not one has been prosecuted for crimes against humanity despite membership in ISIS.